When asked what Enyel De Los Santos needs to continue working on to complete his development in Triple-A, Dave Lundquist didn't have an instant answer. That's how good his right-hander has been so far in 2018. Philadelphia's No. 13 prospect allowed one hit over seven innings, running his personal scoreless streak to 19 2/3 innings as Triple-A Lehigh Valley blanked Pawtucket, 3-0, on Wednesday at Coca-Cola Park. 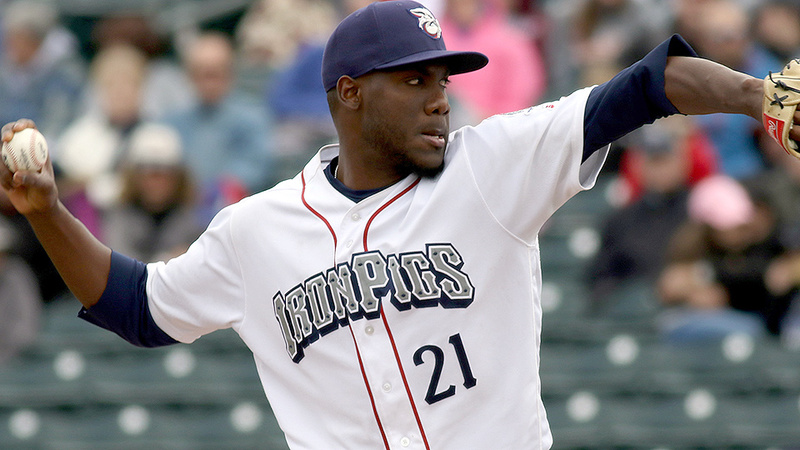 "He's pounding the strike zone," IronPigs pitching coach Lundquist said after the victory. "He's throwing a lot of strikes. He shows four plus pitches at times, and he has a lot of swing and miss. Fastball, slider, changeup, he draws a lot of swing and miss and a lot of awkward contact, soft contact. When he's not striking guys out, he's missing barrels and inducing weak contact, the things you want for a starter to go deep into games. He's been strong in all aspects." De Los Santos faced one batter over the minimum in his first three innings before running into his only jam in the fourth. After walking Aneury Tavarez and Jordan Betts to open the frame, the righty struck out Pawtucket's Mike Olt, induced a weak groundout back to the mound from Ramon Flores that advanced the runners to second and third and fanned Ivan De Jesus Jr. to strand the pair in scoring position. "The first two batters, I thought his rhythm was off a little bit, but I thought he did a great job making fast adjustments, which you have to do," Lundquist said. "He struck out two and got a soft ground ball back to him, and then he was on a mission. That was enough. He had thrown enough balls. It angered him that it happened, but he has the presence on the mound to where he doesn't really allow a lot of things to affect him. He just gets himself right back into attack mode. Beginning with De Jesus Jr.'s strikeout, De Los Santos retired the final 10 batters he faced on the way to his fourth straight win. "It shows that he has very good composure," the pitching coach said. "There's no panic. He doesn't pitch like a young pitcher, and again, having powerful stuff, swing-and-miss stuff, you have a pretty good chance of working out of some of those jams with being a strike-thrower and with plus stuff." De Los Santos has yielded just 10 hits during his scoreless streak with 17 strikeouts and eight walks. Wednesday's victory dropped his ERA to 0.84, the second-best mark in the International League. "I think just the success that he's had, he's gained more and more confidence," Lundquist said. "I think he knows that his stuff is good. He's really in attack mode every hitter he faces, and the more he faces these hitters, the more he gets them out, the more confidence he has and the more trust he has to be creative in sequencing different at-bats." So what's the next step? After a pause, Lundquist offered one possibility. "Like today, walking the first two guys, I think if he's able to make adjustment before he walks those two guys, obviously he has good enough stuff to work around it," he said. "To stay away from those situations before they happen, to make those small adjustments a little bit faster [is key]." Nick Rickles led the way at the plate for Lehigh Valley. De Los Santos' catcher belted two solo home runs to left field, one in the second to stake his starter to the lead he wouldn't relinquish and another in the eighth for insurance. Pedro Beato pitched around Tavarez's one-out single to center in the ninth for his 10th save of the season.